Two months ago, we reported on a preprint by the Fermi collaboration. Using the observation of the gamma ray burst GRB090510, the authors claimed to have put a limit on a first order energy dependence in the speed of light that would require such an effect to be absent up to an energy scale more than 100 times the Planck scale. In that case, it would have been very implausible any such effect exists, since one would have expected it to set in at the Planck scale, if at all. In our earlier post we discussed why this bound they put forward was based on a weak argumentation. The essential point was assuming the highest energy photon had been emitted during a particular late peak in the low energy spectrum. Since that peak almost coincided with the arrival of the photon the resulting bound was very strong. There is however no knowing exactly when the photon was emitted. The most plausible assumption is that it wasn't emitted before the onset of the burst in the low energy regime. This assumption however gives a much weaker bound, pretty much exactly at the Planck scale. New Scientist reports on Giovanni Amelino-Camelina's stomach aches, and SymmetryMagazine explains the why and how in a very recommendable article Gamma-ray burst restricts ways to beat Einstein’s relativity. For more details, see also our earlier post Constraining Modified Dispersion Relations with Gamma Ray Bursts. Stefan and I, we were in Potsdam the past few days where I was visiting the Albert-Einstein Institute in Golm. While in the area, we also stopped at the "Science Park" in Potsdam. Potsdam may be more famous for the parks of Sanssouci and other palaces of the Prussian kings but this park, on a hill not far off the city center, is definitly worth a visit when you are interested in the history of science. The park has an interesting past: Named "Telegraphenberg" (Telegraph Hill), it originally was the location of a relais station of an optical telegraph system linking Berlin to the Rhine. The park was designed in the second half of the 19th century, when an Astrophysical Observatory and a Geodetic Institute were installed on the hill. The park on Telegraph Hill, Potsdam. It was here that in 1880, Albert Michelson made his first interference experiment to test the direction-dependence of the speed of light. He was a guest scientist at the physics institute of Hermann von Helmholtz in Berlin at the time, and had to move his sensitive experimental setup to quiet Potsdam to escape the noise and vibrations of street traffic in the capital. Of course, Michelson didn't find any signs of the expected ether drift at the time, and thought of his experiment as a failure. Back to the US, he convinced his colleague Morley to collaborate on an improved experimental setup, and the rest is history. The "Michelson Building" on Telegraph Hill, Potsdam. The building where Michelson had installed his interferometer in the basement is now called the "Michelson Building", and accommodates the Potsdam Institute for Climate Impact Research. The most famous monument on Telegraph Hill in Potsdam is the "Einstein Tower," housing a solar telescope. Designed by expressionist architect Erich Mendelson and financed in parts by Carl Bosch (the same Bosch who built the "Villa Bosch" in Heidelberg I visited last year), it is a cute looking phallus symbol whose scientific purpose was to test the redshift of spectral lines of sunlight in the Sun's gravitational field, one of the predictions of Einstein's theory of General Relativity. The "Einstein Tower" solar observatory on Telegraph Hill, Potsdam. Also this experiment failed, due to the thermal broadening of spectral lines and the fluctuations of the Sun's surface which, by the Doppler shift, mask the gravitational redshift and form a source of systematic error much higher than originally expected. Evidence for the "Gravitational Displacement of Lines in the Solar Spectrum" eventually came from other observatories, and unambiguous proof of the gravitational redshift finally was provided by the experiments of Rebka and Pound in 1959, using the Mössbauer effect to detect tiny shifts in the gamma ray frequencies of iron nuclei. Nevertheless, the Einstein Tower is the only observatory on Telegraph Hill still in use for active research: The solar telescope and spectrographs now serve to study magnetic fields in the Sun's photosphere. The building is quite small. A person in the scene, in this photo Stefan, helps to set a scale. Wikipedia informed us later that the bronze brain with the imprint "3 SEC" was put in place by the artist Volker März in 2002. It is titled "The 3 SEC Bronze Brain – Admonition to the Now – Monument to the continuous present” and symbolizes the scientific thesis that “the experience of continuity is based on an illusion" and that "continuity arises through the networking of contents, which in each case are represented in a time window of three seconds." I wonder what Einstein would have thought of that. On Friday, I gave a seminar at the Albert-Einstein Institute in Golm, near Potsdam. I won't bother you with the details since it was an only slightly modified version of my last month's seminar in Uppsala. Though the seminar at AEI was well attended - the audience was much larger than I expected - it didn't go very well. Constantly interrupted by questions, I forgot half of what I wanted to say, run out of time, and had to skip some slides. While that wasn't a disaster, it destroyed what I thought would have been a well-balanced and interesting composition for a seminar. Worse than that however, I didn't even manage to answer some of the questions to which I normally would have known the answers. I'm just terribly slow if you put me on the spot. All in all, it wasn't exactly the best seminar I've given, and I hope the audience got something out of it. Stefan was also sitting through the seminar. He indeed drove me all the way to Berlin and back, and carried my laptop around. If you're one of those who don't understand why people get married, that's why ;-) While I was trying to locate the secretary at the institute, Stefan took photos of the whole building. It is located on a hill in between fields, and features a closed inner yard (not yet on the google maps photo) with some plants, tables, chairs and of course blackboards. The average age of researchers at AEI seems to be much lower than at typical departments. There is also a strong pipeline going from Perimeter Institute to Golm; we met quite a few people I knew from Waterloo. Bianca Dittrich now leads a group on Canonical and Covariant Dynamics of Quantum Gravity, Daniele Oriti has a group on Microscopic Quantum Structure & Dynamics of Spacetime. My former office-mate, James Ryan, is now in Bianca's group, and Florian Girelli, whose desk I had inherited at PI, was visiting. All together it is a very lively and active place in the field of Quantum Gravity, and one that will certainly continue to play a leading role. As previously mentioned, Perimeter Institute presently hosts the Quantum to Cosmos festival to celebrate its 10th anniversary. If you're among those who, like me, can't be there in person, you can follow the festival online. Most of the events are recorded by the media partner TVO, and the website is well organized, well maintained, and even looks well designed. I'm totally impressed. The event is also covered in the blogosphere by Martin Durrani from PhysicsWorld who is presently Inside the Perimeter and intrigued by BlackBerries and Blackboards. Sean Carroll talked about time and Neil Turok lets us know that Lee Smolin is working on a new book called "The Reality of Time." Yes, it's about time. 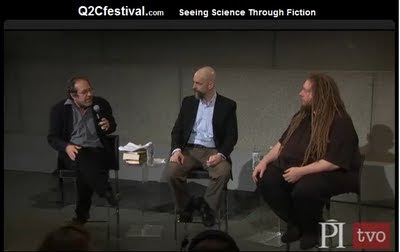 Yesterday evening, Lee lead a very interesting discussion with Neal Stephenson and Jaron Lanier (recording here), on "Seeing Science Through Fiction." "Jaron, (min 38:40): I think there is a benefit to having encapsulation around intellectual activity [...] The notion that everything should be opened and mixed all the time is not good because then you can't nurture something long enough to really understand it. And I think that's a sort of a mistake that's going on on the internet, there's this notion that creativity only happens if everything is as open as possible...."
In my post "And how open would you want your science" I made the same point. Maximal connectivity and exchange of ideas is not necessarily beneficial for scientific progress. I argued that too much exchange bears the risk of washing out differences in approaches too early (I referred to that as "thermalization"), and of streamlining ideas before they have reached maturity. Jaron Lanier has a new book coming out, "You Are Not a Gadget." I suppose I should put it on my reading list. Some days ago Dennis Overbye wrote an article for the New York Times, titled "The Collider, the Particle and a Theory About Fate," about a paper by Holger-Bech Nielsen and Masao Ninomiya, (that we discussed more than two years ago here). Peter Woit called it Embarrassing Crackpottery, which prompted Sean Carroll to explain the difference between speculation and crackpottery: "they even admit what they’re doing." Tommaso comments. Two days later, Peter informs us that the arXiv has reclassified the related papers to General Physics. I meant to simply ignore the whole issue, for I find it quite bizarre. A major daily newspaper reports on an article that hardly anybody in the community cares about, and thereby promotes it to public attention. That in turn annoys those in the community for the reason that it sheds quite an odd light on their own research field. The topic bounces back and forth, thereby only making it seem even more important. We've seen that happening before. Now, yesterday I had an exchange on Facebook on this phenomenon, and I was wondering for your opinion. It seems that science journalists quite frequently pick out the craziest ideas, especially in theoretical physics. That in itself isn't so surprising. I have earlier written about the tension between capitalism and science journalism, and how the internet has worsened the situation. Journalists have a need to entertain that is frequently in conflict with the wish to educate. They need a good story, something that creates a reaction. And Overbye's article did that. Is that good or bad? At least it's a way that physics does catch people's attention! One could argue any attention is better than no attention. If you follow this blog you know that I don't share this attitude. I think journalism in general should try to create a realistic picture. If that's dull, well, then that's dull. After all, it's journalism, not fiction. And stories like this recent one, entertaining as they are, just present a very distorted picture of the actual research. And that in a time when more than half of the population doesn't know a laser doesn't work by focusing soundwaves. The laser btw currently celebrates its 50th anniversary. 50 years and they still don't know. The issue with dullness is that it's relative. Crazy or scary stories create a need of being topped with ever more crazy and scary stories. Unfortunately, we've been running in that spiral for quite a while already. Meanwhile, to excite people you have to tell them at the very least the Earth is about to be destroyed. But then you can ask if not the crazy and the scary stories, what should they write about instead in the newspaper? I will admit that most of our research indeed is quite boring and repetitive. It's just small variations on always the same theme. I bet it's the same in your job. When I read popular science articles about other fields than physics, the ones that I appreciate most provide a review on a particular research direction. They tell me what the theories are that are being discussed today, what the evidence is, and what the current controversies are about. They tell me what is presently in the minds of the researchers who work in that field. I suppose if you're among these researchers, that's dull. I also suppose if you're a science journalist who has written about the same thing a dozen of times already, that's also dull. But who are you writing for? As far as I am concerned, unsolved questions always make good topics. I want to know what's going on at the frontier of research elsewhere. I don't want to know what the crazy outliers do, I want to know what the central problems are. Give me the big picture, give me a basis. If I want to know more details, I'll look for them. Likewise, I would want it to be better communicated why physicists are interested in what they are interested in. And not articles that make it seem like we spend time with things in fact most of us don't care about. So, what would you want to see an article in the NYT about? While every day my confusion grows"
We are used today to give the coordinates of a place on Earth using latitude and longitude, indicating longitude in degrees east or west, respectively, of the Greenwich Prime Meridian. Thus, for example, the small amateur observatory Sternwarte Peterberg near the place where I did grow up is located exactly 7 degrees east of Greenwich. However, looking up the location on historical maps, I don't find this longitude. Actually, the French engineers who around 1800 drew the first detailed topographic maps of the region did measure longitude with respect to the Paris Observatory. Their Prussian successors used the El Heirro Meridian, which goes back to Ptolemy in the 2nd century, and later switched to coordinates centered at Berlin. Actually, in the second half of the 19th century, more than a dozen "Prime Meridians" were in use, creating increasing confusion for transport, trade, and communication around the globe. "That a meridian proper, to be employed as a common zero in the reckoning of longitude and the regulation of time throughout the world, should be a great circle passing through the poles and the centre of the transit instrument at the Observatory of Greenwich." "That the Conference proposes to the Governments here represented the adoption of the meridian passing through the transit instrument at the Observatory of Greenwich as the initial meridian for longitude." There was one negative vote, and the delegations from Brazil and France abstained from voting. The French delegation led by astronomer Pierre Jules Janssen, the discoverer of helium, had pleaded for keeping the El Heirro Meridian, but it seems that long tables of data, from tonnages of ships to sales figures of nautical charts and almanachs, all using Greenwich as their reference point, convinced most delegates to officially adopt the de-facto standard. In 1911, also the French switched to Greenwich longitude and Greenwich time. 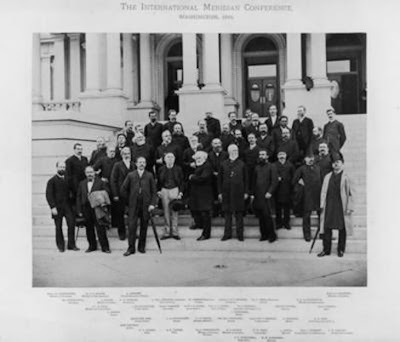 The complete PROTOCOLS OF THE PROCEEDINGS of the International Meridian Conference are available via the Project Gutenberg. 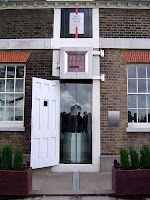 The vote on the adoption of Greenwich meridian is reported on page 99. This year's Oskar Klein Memorial Lecture at AlbaNova was given on October 1st by Peter Higgs. Unfortunately I missed it due to my trip to Atlanta, but you find the recording of Higgs' talk "My Life as a Boson" (wmv) here. I am happy to let you know you there will be a second installation of our 2007 workshop on "Experimental Search for Quantum Gravity," which was held at Perimeter Institute. The next one will take place in July 2010 and will be hosted by Nordita. Details are to follow. If you like nightskies, check out the Gigagalaxy Zoom project. Some days ago I met with a reader of this blog, who, after hearing I moved to Stockholm, sent me an email. So we went for a coffee and talked. Among other things about reasons to unsubscribe from blogs. We found we had both unsubscribed from blogs because they were posting too much. 15 new items? Mark all as read! This reminded me of a poll, according to which too much posting is indeed the top reason for unsubcribtion. Thus, if you're one of these 24/7 bloggers that think they have to echo every news item, calm down. Intellectual Elitism? You get what you give. The other day I found out Steve Fuller has joined the bloggers! Fuller is a prof for sociology at the University of Warwick, UK, and probably one of the most prominent figures in the realm of the sociology of science, knowledge discovery and management, and something called "social epistemology" (I apologize for my intellectual insufficiency, but I have no clue what that is). His blog is called "Making the university safe for intellectual life in the 21st century." Steve Fuller was one of the participants of our last year's conference "Science in the 21st Century," though he could unfortunately only take part via a video link, due to prior commitments. (Worse than that, the recording failed. Shame on the IT staff.) I had been expecting a charming British accent, but as Wikipedia tells us Fuller is actually from the East Coast. He has also been among the advocates of an initiative called "Academics for Academic Freedom," fighting for the right of academics to offend. You see, he has some experience with offending people. Blogging is also an excellent tool to that end. a) I think the man could need some traffic to his blog, so go and give him a welcome to the blogoshpere, and have an eye on his writing. Or go ask him what "social epistemology" is. b) He had a post today that briefly touched upon the question of how to measure scientific success (output/impact/whatever), triggered by a comment in this week's THE by Adam Corner, claiming that the "desire to see research prised away from pragmatic objectives risks a return to intellectual elitism." "Intellectual elitism" is one of these words that I find offensive. It is frequently used to express the conviction that academics, if there indeed was such a thing as "academic freedom," would not care whether their work was of any use for the society they live in. They would just levitate above the clouds and waste the taxpayer's money. Thus, so the argument, they need to be forced to produce useful outcome, call it "pragmatic objectives". And "useful" needs to be quantified by a metric, in the best case economical, but in any case something that you can put into Excel. You see, if it doesn't end up being something you can buy at Walmart, then what's all the research good for? Everybody who has ever in their life had any actual contact with researchers in academia knows that this picture of the academic mindset is completely wrong. Academics do not feel more or less responsibility to contribute to the social good than any other part of our societies. In fact, the more "basic" their research is and thus the more detached from the average persons day-to-day live, the more they are painfully aware their work is not of immediate use, and there is a high risk it will never be of use. That is not a pleasant position to be in. You wouldn't believe how often I have talked to friends and colleagues about this. Some leave academia because they want their work to be of more immediate use. And for those who stay it will be a question that comes back. If you need an example, read what Daniel over at Cosmic Variance wrote just yesterday, when he was comparing his work as a physicist to that of economists. He "confess[es] to a certain amount of envy" because, unlike theoretical physics, "what economists do and say really matters, in an immediate and tangible way." That is not to say "intellectual elitism" doesn't exist. It surely does. But it's caused by rather than being a reason for social detachment. The "elitism" you see, hear, and frequently criticize on this blog is not more than a forward defense that is amplified by exactly that criticism. It is a difficult job to work on basic research: non-profit, a very very long-term investment of your society, a job that brings a high risk that nothing of what you do will ever be good for anything. In addition to that, most of them have to live in an atmosphere where academic research is over and over again discredited as a waste of money. Long-term investments are never easy to justify in politics. It is even worse if your research is hard to communicate to the general public. As a consequence, researchers start telling themselves and everybody else that they are special, and form communities that are to some extend exclusive to enhance their group identity. They might chose to engage in public outreach to better embed their research into our societies and offer their knowledge - to make themselves more useful. And they make jokes about their own irrelevance, as Daniel ends with saying "maybe I’d rather not have to worry about destroying Iceland while looking for a bug in my code." But the fact is, those working in academic research are special. "Elitism" isn't a good word though, maybe one should call it "expertism." Academic research differs from other jobs in many ways, but it is certainly not the only job where people feel special. Politicians I guess suffer from a particularly difficult sort of "specialness." Policemen do too. Look at any job-related community, and you'll find some in-group behavior, some commonly shared ideals that they are proud of. Serving the public. Save neighborhoods. 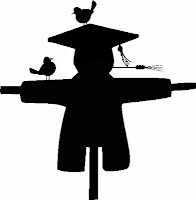 What do academics have to be proud of other than their intellectualism? The bottomline is, "Intellectual Elitism" is nothing but a word that's being used to justify limiting academic freedom. Or to express anger about not being part of the "elite" community. But the "elitism" that you see is merely a defense by people in a socially difficult position, who have to cope not only with the knowledge that their work and life can eventually be completely useless, but also with constant public criticism. You get what you give. You'll be ok, follow your heart"
As previously mentioned, I spent the last days on the Atlanta Conference for Science and Innovation Policy. To apply for a talk, one had to submit a paper already in February. At that time, it wasn't clear to me I'd be living in Sweden when the conference actually took place. Flying from Europe to America for only a few days is very exhausting, plus I have to cover expenses myself. But I am glad I went. The conference has been very interesting, I learned a lot, and got useful feedback on my talk. It was a very interdisciplinary meeting with a diverse audience. People were here from engineering, over economics, psychology to various disciplines of the social sciences, from institutions outside academia and from funding agencies. And then there was the theoretical physicist. Participants came from all over the world, many from developing countries, since science policies in the developing world was one of the topics on the program. I spoke to a PhD student who studies science policies in Argentina and Chile, esp. their telescope programs, and talked to some people about Neil Turok's initiative AIMS. I learned about a project called ARGO, a truly international project, which maintains an array of floats to measure water temperature and salinity. I've also never been at a conference where the woman to men ration was so close to 1/2. It is pretty much impossible to summarize the conference. You will get a good impression of topics if you look at the lists of talks and abstracts, which you find here. What I found somewhat annoying was the high number of parallel sessions, up to 7, which means no matter what you'd miss several of the talks you wanted to hear. The organizers also tried out a new sort of session called "roundtables," that for all I can tell worked badly. They took place in one room with, guess, round tables, with about 8 seats each and a different topic for each table. While this created a nice atmosphere for discussion, the catch was that the people leading the discussion (at least at the tables I was) had applied for a talk and only learned two days earlier they were supposed to be on a round table instead. As a result, they just printed and handed out their presentation or, worse, put their laptop on the table and pointed to it. That sort of format might have some potential though if the topics for discussion are chosen differently. It very efficiently bridges the gap between the speaker and the audience. I went to a couple of talks on collaboration- and coauthorship networks, both in the scientific community and for patents, investigating the change in these networks over time and the development of new fields or collaborations. These studies in the area of scientometrics are one of the fields at the intersection of the social, natural and computer sciences that have only become possible within the last decade, because data wasn't available or couldn't be handled before that. I find them tremendously interesting, as they tell a lot about the process of knowledge discovery with the prospect to better understand which conditions are beneficial or counterproductive. Needless to say, funding agencies have a certain interest in this research and in fact, some of these studies were commissioned by the NSF. Also here was Bela Nagy from the Santa Fe Institute, who spoke about Comparing forecasts of technological progress. I missed the first half of his talk, but he set up an open database at pcdb.santafe.edu where you can download or play with the data he analyzed yourself. You can also upload your own data. You find an introduction to his research on YouTube. Some instances were very amusing. For example, in a panel discussion the first day one of the speakers, Caroline Wagner from SRI International, began with saying she recently heard on the Science Channel that we live in a world with 11 dimensions. Then she compared that to the "multidimensonality" in her field of work. She asked the audience how many had heard of these 11 dimensions. From about 200 people, maybe 5 raised their hand. Another speaker, Diana Hicks, renamed normal- and power-law distributions into "hill" and "pipe" distributions, explaining that a quarter pipe is the only real world example for a power law that she could find. Since the curve of said pipe actually falls to zero at a finite value, and certainly has no "fat tail" of any sort, it was somewhat unwillingly comic. In any case, the talk raised an interesting question. Hicks pointed out that the relation between the number of scientists and their output is not a normal distribution, but that instead a few scientists (or institutions respectively) are top and carry a load of the output, and then there are a lot who don't contribute much. The question is then whether funding should be distributed proportionally (to any measure of such scientific output), or more equally. Besides "power law," other buzzwords of the conference were "vertical disintegration," "transdisciplinarity" and "complex systems." It is amazing how easily one can get a speaker to stumble by simply asking what they mean with "complex." I also learned that what the NSF calls "transformative research" is called "Frontier Science" in Europe. Somebody pointed out in his talk that support of innovation is almost exclusively on the supply side, by funding basic science, and argued that one should stimulate also the demand side. It's an interesting thought. Presently it seems to me the supply- and demand side for basic science is pretty much identical. Several people spoke about their initiatives, institutes, or conferences with the purpose to get science policies across to the governments of various countries. What I find puzzling though is how completely disconnected these studies about science policies, collaboration, group dynamics, interdisciplinarity, and so on, are from the researchers who actually work in these fields. This disconnect was one of the reason for our last years' conference on Science in the 21st Century. My own talk on "The Marketplace of Ideas" went very well, despite a cold that I seem to have caught on the plane. I will give you a summary later. Listening to my coughing and sneezing, somebody recommended a homeopathic remedy in the coffee break. She would take it before the fist symptoms set in, and it had helped her to avoid getting a cold in the first place several times. Makes one wonder. I'm flying back to Sweden tonight, just in time for the announcement of the Nobel Prize. Thanks to my jetlag I woke up hours before sunrise, and used the early morning hours to finish my FQXi essay. This years' topic is "What's ultimately possible in physics?" You find the list with submissions here, the deadline is midnight today. I haven't yet had time to look at any of the other essays, but I'll check these out when I'm back from the conference. It promises to be an interesting contest. I had pushed the question the contest raised back and forth for a while, and finally came to the conclusion that it cannot be answered. My essay explains the line of thought that lead me to this conclusion. You find my submission on this website, title and abstract below. At any time, there are areas of science where we are standing at the frontier of knowledge, and can wonder whether we have reached a fundamental limit to human understanding. What is ultimately possible in physics? I will argue here that it is ultimately impossible to answer this question. For this, I will first distinguish three different reasons why the possibility of progress is doubted and offer examples for these cases. Based on this, one can then identify three reasons for why progress might indeed be impossible, and finally conclude that it is impossible to decide which case we are facing.